Technically, ticks are not “bugs” or insects. Rather, they are arachnids related to spiders, scorpions, and mites. These tiny blood-sucking external parasites attach themselves to virtually any host that contains blood -- wild and domestic mammals, birds, and reptiles. People are also tasty hosts. Ticks locate us from our carbon dioxide when exhaling as well as our scent and body heat. 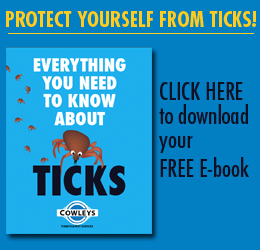 Since ticks live in the woods, fields, and brushy areas, those who work outside or who enjoy outdoor activities or even just gardening in their own backyard should be aware of the prevalence of ticks in New Jersey, the ease in which a tick can attach to one’s skin, and the risk of disease transmission. These tiny creatures can and do cause permanent health problems through transmitting infected blood. And the longer an infective tick stays attached and feeds on its host, the greater the chance of infection. "Jorge was professional, friendly and courteous. He did a great job!" Jorge was professional, friendly and courteous. He did a great job! As a relative of spiders, adult ticks have eight legs and two body segments. The black-legged tick (deer tick) is about the same size as the head of a pin whereas a dog tick can be up to one-half inch long. The appearance of a tick changes as it goes through its life stages from larva to nymph and adult -- so the tick species cannot be determined by size alone. 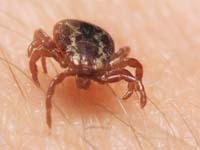 The nymph period is especially dangerous because the ticks are so tiny – the size of a poppy seed -- yet still carry potentially infected blood causing tick-borne illnesses that can be difficult to diagnose and treat. Often these ticks bite and fall off without the host even realizing they were there! Tick identification is not easy, even for experts. The safest thing to do is have the tick identified and, if necessary, tested by a laboratory to determine if the tick’s blood is diseased. The tick engorgement level is critical since transmission does not happen immediately and the engorgement level is a strong indicator of how long the tick was attached. Every New Jersey county has a tick identification and testing program. Please take advantage of it! Remember, here in New Jersey, it is estimated that almost 50% of adult black-legged ticks are infected with Lyme disease. Where can you find ticks in New Jersey? You don’t have to go far. Just check out your own backyard! One of the biggest misconceptions about ticks is that you can only get them trudging through deep forests and areas with high vegetation. Studies have shown the precise opposite. Approximately 70% of Lyme disease transmissions are from tick bites in one’s own backyard. As larvae, ticks feed from small mammals like rodents, bats, deer, and other wildlife. Ticks ingest and store infected blood from these reservoir hosts and then progress into their tiny nymph stage. Nymphs inhabit vegetation as low as 4-6 inches, the typical vegetation found in anyone’s own yard. The ticks then transfer the diseased blood from that host to whatever or whoever is unlucky enough to be their next blood meal. 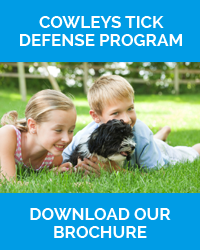 How can Cowleys help homeowners with their tick control issue? For effective tick control and reducing the risk of your family or pets suffering tick bites, homeowners need to implement two related strategies. Both are necessary; one without the other isn’t enough. 1. The first strategy is outdoor habitat modification. You want to make your lawn and landscaping to be unattractive to ticks. This includes discouraging potential tick-carrying rodents and other hosts from entering your property as well as creating an environment unsuitable for tick survival for those who manage to sneak in. Regularly mow the lawn, trim back overhanging shrubs, limit birdfeeders to winter months, and remove leaf litter, plant debris, and other potential tick harborages. 2. The second strategy is the prudent use of low environmental impact tick treatments. In residential areas where ticks are abundant, treatments are necessary to reduce tick populations. Tick treatments are quite effective when used selectively and intelligently. You want to specifically time and target treatments to those areas where ticks breed and quest rather than attempting some haphazard application and hoping for the best. A professional pest control firm will help homeowners significantly reduce the tick population around their property. 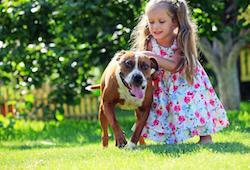 Especially for those with children and pets, tick control and reduction becomes an important health and safety issue. 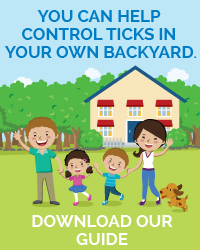 If you have questions about tick control on your property, contact the pest experts at Cowleys Pest Services for a free inspection and estimate. They proudly work with homeowners in Woodbridge, Edison, Lakewood, Brick, Toms River, Piscataway, Trenton, Middletown, Princeton Junction, Old Bridge, and the surrounding area.